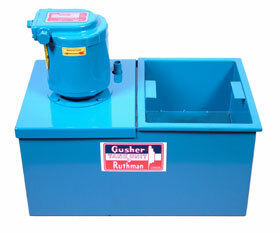 Since 1913, Gusher has grown their centrifugal pump product lines into one of the largest selections available from a single manufacturer with the Rumaco, Ruthman, and Gusher pump brands. Models include close-coupled pumps, end suction pumps, immersed pumps, self-priming pumps, vortex pumps, sludge pumps, multi-stage pumps, and full cantilever pumps. Gusher has expanded their product lines farther by offering custom pump designs to suit your application. Many of the pumps come in vertical and horizontal styles, suited for small and large flow rates and the multistage pumps are capable of heads over 800 ft. Multiple applications and specifications are available including, Din specifications, ANSI specification, machine tool and centralized coolant systems, automatic paint systems, industrial spray washers, filtration systems, phosphate, bonderizing, and many more. Under the name of Ruthman Companies, every employee, vendor and subcontractor, shares a common goal of quality and reliability at an affordable price. Because they listen to customer needs and requests, they have been able to demonstrate innovation and flexibility with their products. 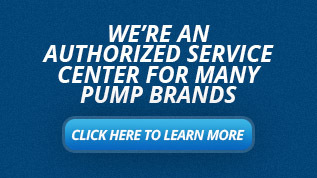 See below to discover how Gusher’s horizontal and vertical coolant pumps, multistage pumps, self-priming pumps, machine tool tank units, Din pumps, ANSI pumps, and many others can meet your application needs and exceed your expectations. Gusher offers the 7600 series top pull out series, enclosed column, vortex, slurry, and the 7550 series vertical end suction centrifugal pumps. 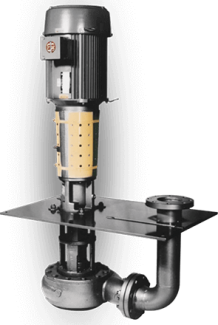 These vertical pumps completely remove the need for a seal, there is no alignments required, and require less floor space. The 7600 is designed to minimize maintenance by making the rotating element removable without disturbing the mounting plate or piping. The pump can be either chair mounted or barrel mounted. Applications include spray booths, filtration systems, paint systems, spray washers and many more. Gusher coolant pumps include immersed, flange mounted, Rumaco pumps, tank units, and replacements for imported machine tools. Immersed types have 5 configurations to meet you inlet and out let style needs, with single, dual, and stand pipe inlets. Flanged mounted types are best when space is limited and an immersion cannot be used and has both external and internal discharge options. Rumaco pumps are centrifugal, open impeller type pumps with features such as self-adjusting seals to help installation, throttling without increasing motor load, flange and pipe inlets types, and a wide range of sizes for any application. Tank units are available in 10 to 200 gallons with pumps from 1/25 through 7.5 HP and can be used as permanent, portable, or auxiliary coolant systems. The DIN and ANSI centrifugal pumps feature standardized engineered parts to ensure interchangeability enabling quick and easy conversion of the pump assembly to you application. DIN pumps are designed to match the DIN 733 standard dimensions and the volute inlet and outlet flanges are made according to the PN16 standard. 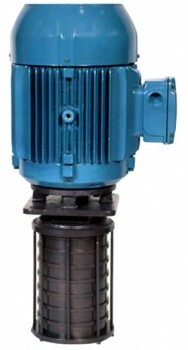 The ANSI pump is designed to ANSI 73.1 styling with ANSI 16.5 flanges. 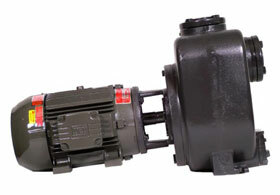 The Gusher Vortex Non-Clog series pumps are designed to handle large solids and fibrous materials without clogging. Even with low flows, the Vortex Non-Clog Series Pump design allows throttling to a low performance range that is unacceptable to many centrifugal pumps. The complete Vortex Non-Clog line has been designed to pump various oils and liquids containing up to 30% entrained air. It will operate 23% below its first critical speed at any point of operation. The 8000 series has a wide range of uses from agriculture and industrial. They have semi-open impellers and can have an external impeller adjustment. Maintenance is easy with the back pull-out configuration. They also feature clean out ports for fast removal of foreign objects. Available in stainless steel and ductile iron construction and can be gasoline or diesel engine drive with base mount or close couple styling. Applications include filtration, irrigation, dewatering, tnak car unloading, sump transfer, and many more. The multi-stage line offers both vertical and horizontal styles. They can feature a pressurized system, a double pump capabilities (high and low pressure with one motor), a balanced mechanical seal (silicon and tungsten available), mounting to 10-200 gallon reservoir, and NPT or BSPT connections. Many models include a duel discharge configuration– one used for low volume and high pressure; the other used for high volume and low pressure. A common application is for high pressure machine tools. 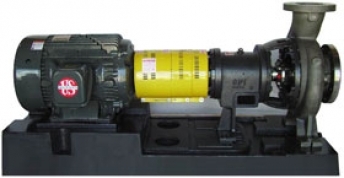 The 7800 Series end suction pump come in self-priming jet pumps, close coupled vertical and horizontal, direct drive, and the SEV line styles. They have dry run capabilities and are available in back pull out with a one piece shaft for easy maintenance. Lengths can be extended to suit your needs. These are available in both cast iron and stainless steel. Applications include spray booths, parts cleaners, coolant systems, industrial sump applications, cooling towers and many more. Screw pumps are best used for cooling lubricants. 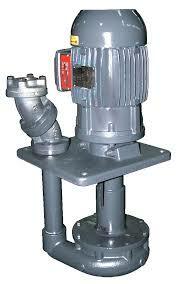 Screw pumps deliver continuous flow with a low pulsation rate and low noise level. Even with small sizes, screw pumps can have a high flow rate and can handle fluids with low viscosities at high pressures. 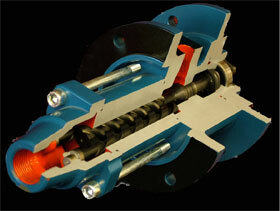 Screw pumps are also capable of handling abrasives and other solids. There is a vertical and horizontal wet or dry well installation. Case coatings are available. TWO/CWO/CDO/YWS Vertical Cantilever– designed from 1″ up to 16″ discharge to handle up to 10,000 GPM. Designed to handle slurries and molten salts and metals up to 1500° F.
FCH/FDV-H/KCR Horizontal– designed from 1″ up to 12″ discharge to handle up to 8,000 GPM. Designed to handle slurries with solids in a large passage impeller and tolerate a wide range of abrasive and corrosive applications. SMR/SML/SMV Submersible Slurry– desgined from 1″ up to 12″ discharge to handle up to 6,000 GPM. Designed to handle slurries with up to 70% solids.